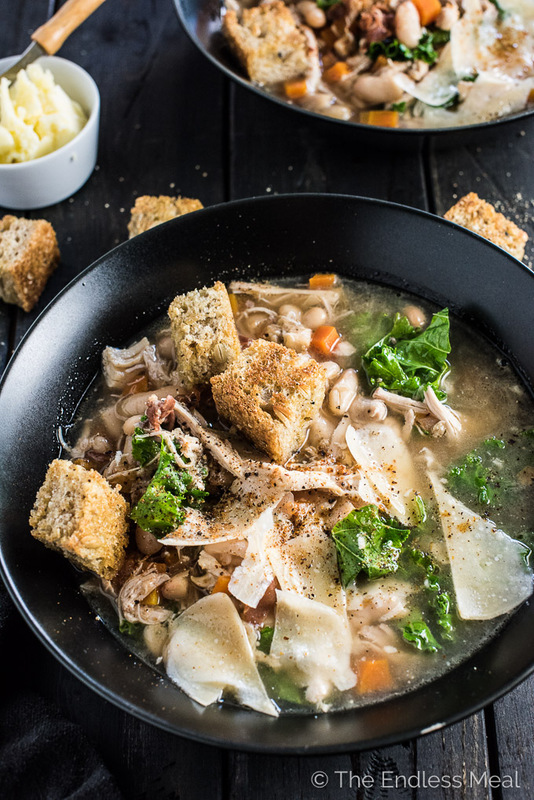 Crock Pot Tuscan Chicken Soup with Prosciutto and Parmesan is the ultimate feel good comfort food recipe for fall and winter. Throw everything into your slow cooker and spend all day dreaming of dinner. You will LOVE this! Two days ago, I shared a post with you that I titled Love Wins. I was really apprehensive about sharing it, but I am so happy I did. I wanted to start this post by saying a great big THANK YOU for all the thoughts, comments, and emails. I heard stories from both sides of the political fence and heard nothing but love and hope for a better future. It has truly reaffirmed my belief that most people in this world are good people. Thank you for that. You guys are awesome! 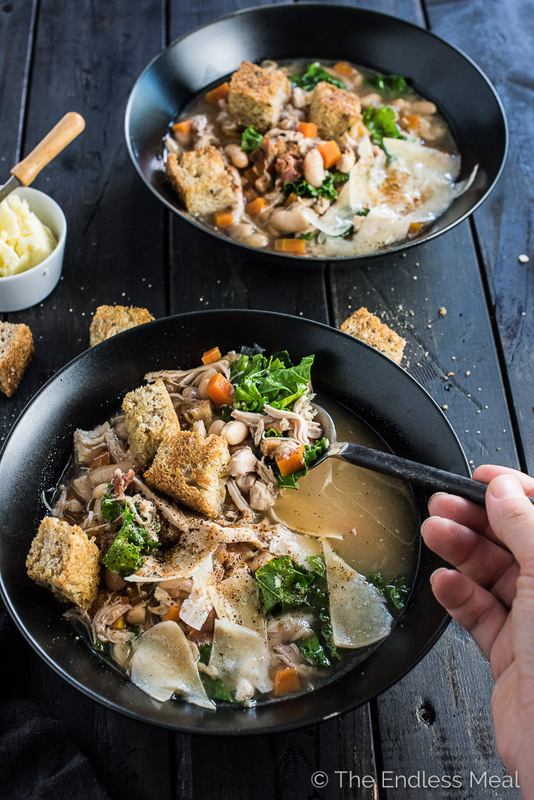 Now can we sit down together to a big bowl of this Tuscan chicken soup, butter up some bread, and share stories and laughter? 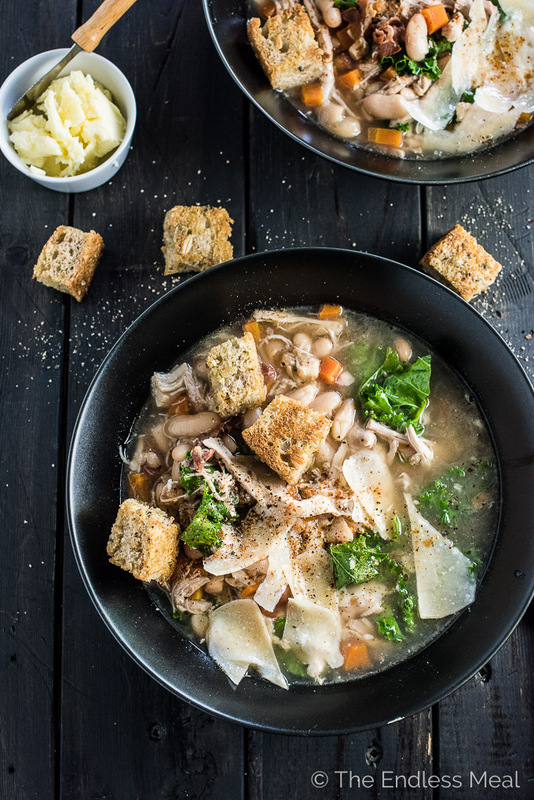 I've made this Tuscan chicken soup to be a little like chicken noodle soup, only so much better. It's a super easy recipe that you basically throw into your crock pot, walk away and enjoy your day, then come home to dinner. It's the best. Cooking the bone-in chicken thighs in the soup basically lets you make chicken stock at the same time you're making soup. It's a deliciously brilliant and easy way to max the flavor of your soup with the least amount of effort. Big time win! ♡ Prosciutto: crisped in a frying pan and salty and delicious. 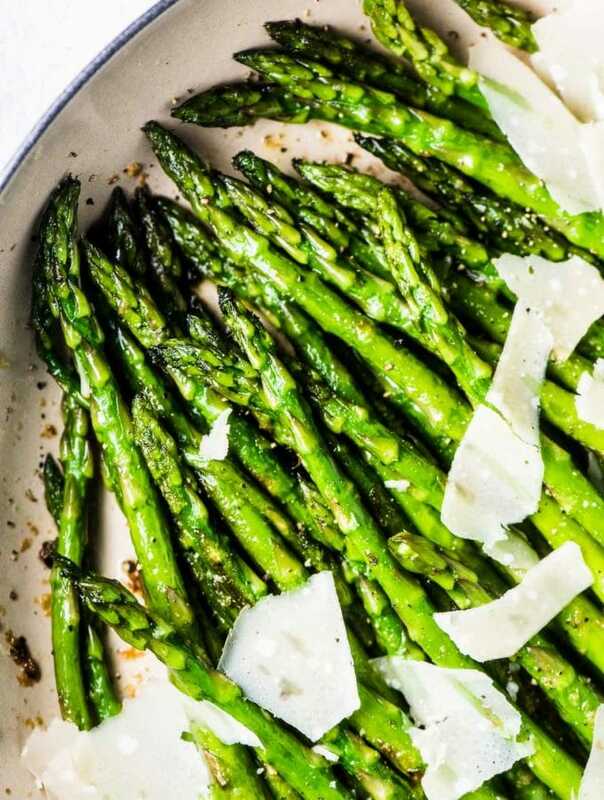 ♡ Parmesan: cheesy salty flavor bomb. ♡ Chicken stock: homemade and so tasty. These three things wrap themselves around each bite so all you'll hear is a bunch of “Ummmms” and “Yummms” around the dinner table. 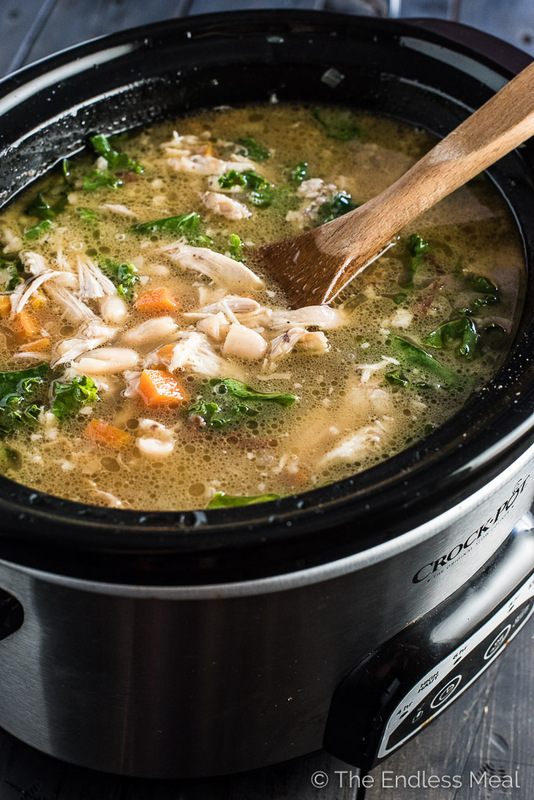 Once the crock pot has worked its magic and turned everything into chicken soup, you're going to add some white beans, kale, and a little squeeze of lemon and work your own magic and turn it into Tuscan chicken soup. Then you'll quick pan-fry some chunks of bread in Italian spices to turn them into croutons and call it dinner. Heat the oil in a large frying pan over medium-high heat. Cut the prosciutto into small pieces and fry and fry until crispy. Add the onion to the pan and saute, stirring occasionally, until it begins to brown, about 5 minutes. Add the garlic and cook for 1 minute more. Empty the pan into the bowl of your crock pot, add the carrots and lay the chicken thighs on top. Place the thyme and rosemary on top of the chicken. Do not mix. Pour the chicken stock over top and set your crock pot to high for 6 hours or low for 10 hours. Remove the chicken from the pot and set it aside. Remove the thyme and rosemary and discard. Remove the bones from the chicken and shred the chicken using 2 forks. Add the chicken back to the pot then stir in the white beans, kale, and parmesan and let the beans warm through. Stir the lemon juice into the soup. 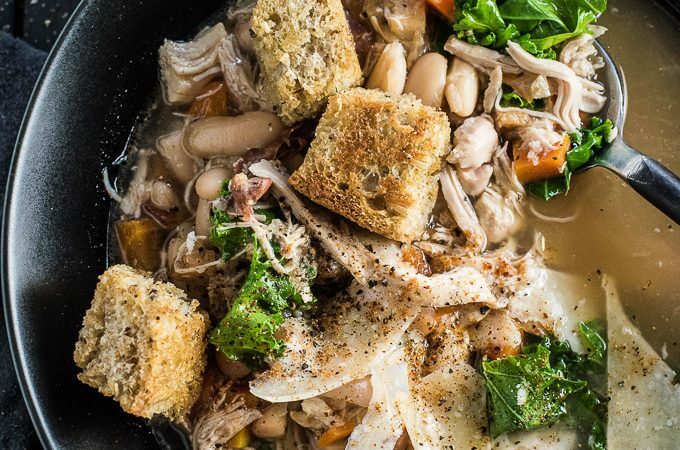 While the Tuscan Chicken Soup cooks, prepare the croutons. Preheat your oven to 350 degrees. In a medium sized bowl, toss the chunks of bread with the olive oil, sea salt, oregano, and cayenne pepper. 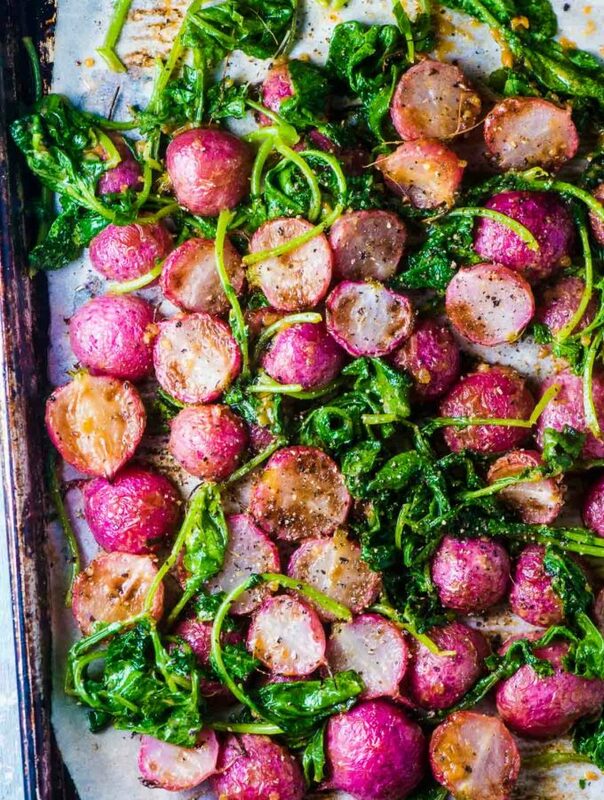 Place the croutons on a baking sheet and bake in the oven for 10 minutes, turning once. 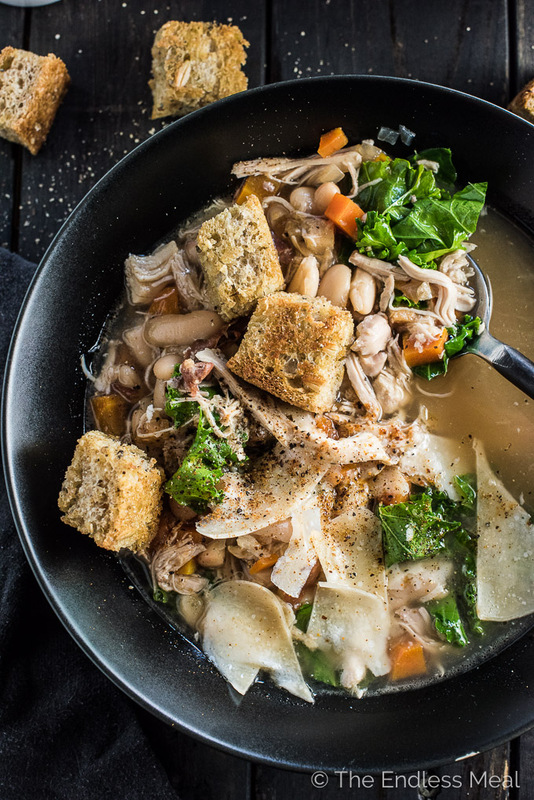 Serve the Tuscan Chicken Soup with the croutons, a little parmesan, some fresh cracked pepper, and a little sprinkle of cayenne pepper on top. Holy delicious. This is such a simple and elegant soup, and I LOVE that it’s made in the crockpot. Not to mention that gorgeous prosciutto! Below the Tuscan soup there were more recipes for other soups – they look delicious! 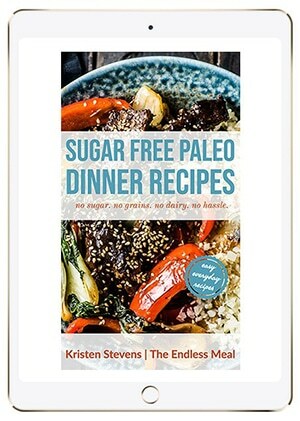 How do I get to these recipes? I am a real soup lover!